A global audience of millions witnessed one of the most spectacular games of World Cup rugby on saturday as Wales and Fiji met in the all important Pool B decider in Nantes. Fiji got off to a flying start, leading 25-3 at one stage with everything going right for them. They controlled play beautifully and then let loose with their devastating backs, Sevens star Vilimoni Delasau having a particularly good game. Wales came back though, and when Martyn Williams scored an intercept try it looked as if it were over for Fiji. The Fijians kept fighting though, and with four minutes left they snuck a try that gave them the belief they needed. Flyhalf Nicky Little, who sadly seriously injured his leg shortly before full time, converted the try with a vital kick that insured the Welsh wouldn't be able to slot a dropkick or penalty to win it. This classic ended with the south sea islanders in front and meant that for the first time sing 1987, Fiji will be in the Quarter Finals of the World Cup. It also meant that Wales will be going home, with their coach subsequently having been sacked. Zimbabwean born Takudzwa Ngwenya scored this electric solo 50 meter dash out of nothing against Samoa a few days ago. He got the ball with not a helluva lot of space but showed exactly what a bit of determination and raw speed can do for a side. Yes, the Samoan tackles weren't great (as the commentator went out of his way to point out), but the running and fend were great. Fantastic to see the USA score a try like this. It also lifted their side and they ended up getting within 5 points of the eventual winners Samoa, thanks to an excellent conversion from captain Mike Hercus. UPDATE: Watch his more recent brilliant try against the Springboks here. The Wallabies were in command against Canada in their encounter on saturday. As they attempted the ever popular crosskick, big Canadian winger Justin Mensah-Coker ruined their plans of the try by showing a true piece of athletic ability and class. Diving backwards and to the side with his eyes on the ball, and with the rain coming down, Mensah-Coker makes a spectacular catch that would have made Peter Cech proud. Great skill and one can't help comment that it looks a bit like a football, or even a gridiron catch, taking into account the part of the world that the player comes from. Fantastic commitment shown by the big guy, getting up high to catch it and importantly calling for the mark at the same time. England played Tonga on friday night at the Parce des Princes in Paris. It was a do-or-die match, with the winner going through to the quarter finals and the loser packing their bags for home. Tonga packed their bags, but on the way to the final whistle they played their hearts out and were menacingly physical as always. 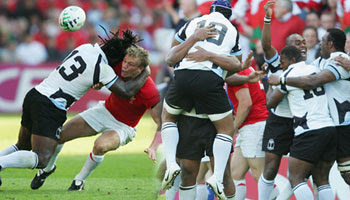 Lewis Moody received the brunt of the knocks, taking two massive hits which would have kept most heavyweight boxers down. The first of which was purely accidental, but brutal nonetheless. The second was unfortunately worse than it was probably intented to be, although Moody took the Tongan captains shoulder to the chin and it was very high to start with. Final score: 36-20 to England. Big Georgian winger Irakli Machkhaneli puts in a huge crash tackle on Namibian Heini Bok as the Namibians try fruitlessly to get the ball wide. Machkhaneli came in fast and hard, blindsiding Bok and hitting him perfectly legally, knocking the ball out of this hands. The bounce after that was perfect, and the Georgian flyer picked it up in a flash and sped off, signalling to the crowd that it's all about heart. Brian Lima's career is effectively over. The Zidane of this years Rugby World Cup has been suspended for three weeks for this high tackle on Jonny Wilkinson, and with Samoa not making it to the next round means we won't see the veteran in World Cup action again. 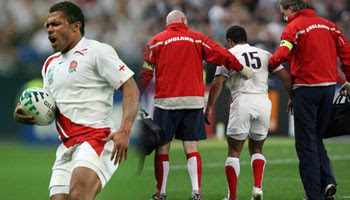 Lima was spoken to by the referee for the high tackle during the England vs Samoa clash, but the Judicial Officer involved in the citing felt it deserved further punishment. 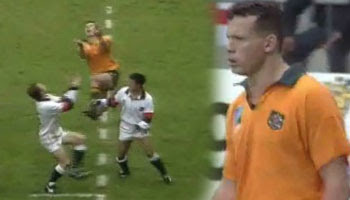 "The tackle was inherently dangerous and the swinging right arm of Brian Lima connected with considerable force on the neck/throat of Jonny Wilkinson." Three weeks for this tackle is once again inconsistent and harsh in this instance, but perhaps had a little something to do with his previous big hit on Andre Pretorious that went unpunished. Either way, we bid farewell to The Chiropractor, who made an invaluable contribution to Samoan and world rugby over the years. As mentioned in the previous post, the match between Japan and Canada ended with a thrilling last minute try, leaving Japan 2 points behind the Canadians, with the conversion to come. Shotaro Onishi was the man entrusted with the hugely important kick that would see his team drawing the match. Onishi stepped up to it, and with the Canadians charging at him, kept his head, followed through, and made history. Surely one of the biggest nights in Japanese rugby, and the global audience will agree, one of the better finishes to a game we've seen this year. 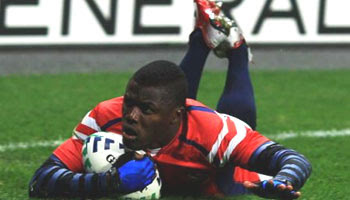 Japan bid farewell to the 2007 Rugby World cup this week in their match against Canada. The match ended as a 12-12 draw after some brilliant fighting spirit was shown by the Japanese. A thrilling final try and equalling conversion in extra time was the lifeline they needed. A fair result and one of the most exciting ends to a match I've seen all tournament. Earlier in the game though there were some huge hits put in. Real bonecrunchers that made the Cannucks think twice when taking it to the line. Great to see guys who are normally known for being small and fast putting in big hits. I'm neither a Canadian nor Japanese fan, but for the neutral, a fantastic game of rugby with a nailbiting finish. In a lot of ways it felt like a victory to Japan though. We'll try get the 'equalling' final kick up here soon. Ireland haven't had a whole lot to cheer about during this World Cup. Their performances have been anything but inspired, with narrow victories over minnow sides, and then a significant loss to hosts France. One thing worth seeing though is this clip of captain Brian O'Driscoll's big rib tickler tackle on French fullback Clement Pointrenaud. A great textbook tackle, showing that you can hit hard while still tackling legally. The meeting between the Scots and New Zealand at Murrayfield Stadium on Sunday was much talked about in the media prematch. The reason was that the Scots said they'd be resting their mainline players as they had no chance of beating the World Cup favourites anyway. They were right and the All Blacks, who were clearly pumped up for the Haka, looked like they wanted to prove a point, winning the match 40-0 despite not being 100% clinical. Firstly, that All Black/White/Grey kit looked absolutely horrendous. The fact that on the field both sides looked the same didn't help the occasion and showed poor planning by the organisers. I actually expected them to change their jerseys and come out wearing black at half time. Didn't happen. I can only imagine how confusing it was for them out on the field. My second observation is that Ali Williams is slowly becoming a bit of a joke when performaing the Haka. I admire him as a player who is a competitive, talented, and hard working second rower. But when performing the Haka he makes me laugh. There's nothing scary and intimidating about a guy like him sticking his tongue out. It just looks a bit too exaggerated and fake. It works for some players but he is certainly one it doesn't suit. Dan Carter is another. Tana Umaga on the other hand would have me shivering in my boots and asking for a new pair of shorts. 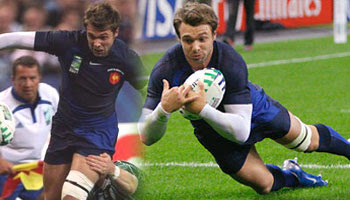 Friday night saw Ireland fight Les Bleus for every minute of the match. Their commitment at scrum time was massive, but their lack of discipline cost them. Ireland quickly fell out of touch while the French kicked over penalty after penalty. A Ronan O'Gara drop goal gave the plethora of Irish supporters some hope, but in the hearts they knew that France was in the driving seat most of the match. Brilliant vision to spot the open space and immaculate execution of the popular 'banana kick' from fly-half Frederick Michalak put Vincent Clerc away in the corner. The French proceeded to twist the knife to produce an impressive final score. This has got to be a serious contender for try of the tournament. Not only because it's a great try spanning the length of the field, but because once again we see a minnow team playing great rugby against a traditional rugby nation. Last night the Japanese lost this game against the Welsh 72-18, but they performed admirably in the first half and held their heads high. 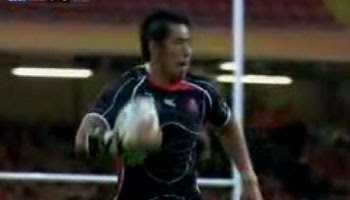 Kosuke Endo's try will no doubt go down in history as one of the best Japanese World Cup tries ever seen. One of the most talked about players at this years World Cup, Sebastien Chabal comes up with this classic line in a recent press conference. Some people will say this shows pure arrogance. I personally think it's pure comedy. A great moment from the World Cup. 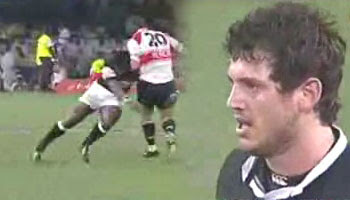 This is one of my favourite and most memorable tries from the 1995 World Cup in South Africa. Young Wallaby wing Damian Smith gets up high to catch the perfectly placed Michael Lynagh bomb. Mike Catt is literally knocked over in the process of attempting to mark it, and Smith rolls over for a fantastic try. Brilliant athleticism and commitment, keeping his eyes on the ball at all times. A truly great World Cup try. 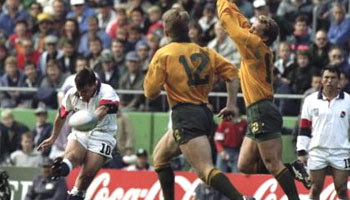 In the 1995 World Cup quarter final in Cape Town between England and Australia, flyhalf Rob Andrew kicked this winning dropgoal to secure the victory for the English. It knocked the previous World Champion Wallabies out of the tournament, and resulted in a 25-22 win. 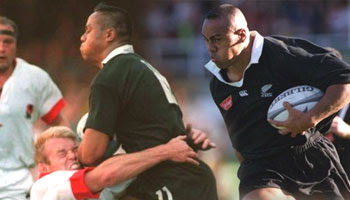 What it also meant is that England faced a meeting with the almighty All Blacks in the semi final, and in particular, Jonah Lomu. But that's another story altogether. With the 2007 World Cup currently taking place, we've already seen a few dropgoals being snapped up, and my thinking is that we may yet see history made later in the tournament, with precisely this form of adding to your teams total. There have been calls for the dropgoal to be reduced to less points as people feel it's just to easy. In my opinion its an art form that is achieved through hard work and takes some skill to achieve, especially under pressure. Time will tell, but watch this space - a winning drop may just determine the outcome of the tournament. 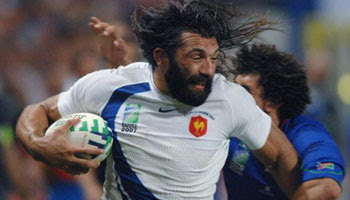 Two tries by Sebastien Chabal helped France achieve a 87-10 victory over Namibia in Toulousse on sunday evening. With a French crowd baying for blood if the home team didn't perform, the hosts came out firing and totally demolished a Namibian team that were down to 14 men after the 19th minute. Chabal started this match in the second row and showed what a valuable asset he is to the team with his agility and awareness of space. He took some good lineout balls as well as bashed it up well. The first of his two tries came when France were awarded a penalty close to the line, and some quick thinking from scrumhalf Jean-Baptiste Ellisalde put in a neat crosskick for Chabal to collect and fall over the line. The second of his tries put the first one to shame. It came from a close to 60m penalty kick attempt from the Namibian fullback Loster. The kick fell short, and France returned the ball with interest, rapidly getting up to the halfway line and creating fast second phase ball. After swinging it wide, the big caveman received the ball well inside his own half and took off, sniping through the tiniest of gaps and showing superb acceleration that I, for one, didn't know he possessed. Leaving the Namibian's for dead and brushing off three would be tacklers, he charged over the line for what for me is already one of the best tries of the tournament. Seabass started at lock on sunday night in the mismatched game between hosts France and Namibia, once again showing his versatility and giving more options to French coach Bernard Laporte. 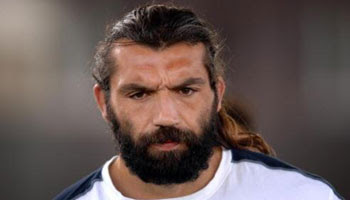 Chabal is not someone who goes unnoticed on the rugby field though, as he poses a threat whenever he has ball in hand, purely because of his strength, aggresion and as you'll see later, speed. So when he got the ball in a little space, Namibian eighth man Jacques Nieuwenhuis wasn't taking any chances. He swooped on Chabal and hit him hard and high, resulting in the Frenchman being left in a daze on the floor. Referee Alain Roland promptly issued the straight red, and Namibia had to play the rest of the game with 14 men, which probably contributed to them going down 87-10. Nieuwenhuis was warned a couple of times before that, but to give him a straight red clearly meant that Roland viewed his intent as deliberate and a direct attack on Chabal. And he was probably right. Another dismal performance from a superpower, and another brilliant performance from a minnow. Georgia controlled the game with their big men and forced their way into Ireland's territory. An intercept try, shown here, took them into the lead late in the game. Ireland came back with a try to scrape past and the secure the vital win with the final score being 14-10, despite the Georgians pounding away at their line right till the end. Ireland's RWC 2007 hopes are falling apart. What do they need to do to click for next week's must-win meeting with France? Do they still have a chance to come right or has that time come and gone? Irish coach Eddie O'Sullivan is puzzled, and he admits that if they don't get over this slump they're destined for an early World Cup exit. After the Welsh captain took Berrick Barnes out late with a hard hit, Aussie skipper Stirling Mortlock clearly had one thing on his mind. And as you can see in this clip, he executed it. Revenge was the order of the day, and in the 22 min Thomas got hit hard by the bulky Wallaby center. The hit was fractionally late, but perfectly legal, if that makes sense. In other words, he was commited. Nothing wrong. It could be the last time we see Thomas playing though unfortunately, as he feels that this injury could put him out for 6 weeks, thus ruling him out of the rest of the tournament. And considering that his career will probably come to an end after the World Cup ends, it would leave him stranded on 99 caps and one short of fantastic milestone. The results of the scan on the damaged rib cartilage aren't available yet, but Thomas is fearing the worst. Thomas told the Daily Star: "I've had a similar injury before. My gut feeling is that I'm out for six weeks. "Waiting for confirmation is going to kill me but I think I already know the outcome. "I'd never retire but, if I'm honest, they should be planning for the next World Cup so they shouldn't pick me." Young Berrick Barnes made only his second appearance for the Wallabies against Wales on the weekend. In a game that the Aussies won comfortably in the end, Barnes played well, with some decisive breaks and good distribution. 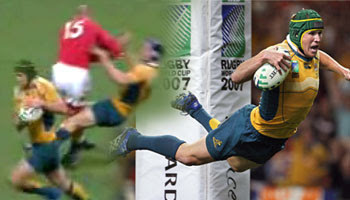 After one of this excellent breaks and a great dummy, he offloaded to Matt Giteau and received a welcome to test rugby from Welsh captain Gareth Thomas. Late and hard, this hit should have resulted in a yellow card. Totally uncalled for and I think the fact that Thomas got away with it has something to do with him being captain. For some reason the refs always take this into account when making decisions. Horrible hit for the youngster Barnes after such a good break, but luckily for him and the Aussies he got up and carried on playing showing no ill effects. Not great by Thomas though, and as you'll see, Australia got revenge. As if the 36-0 demise of a struggling English team wasn't enough, the current World Champions were forced to give a premature farewell to one of England and the British Lions' greatest heroes. Who will ever forget his little in-and-out jink in 2001 to lacerate the greatest defense in the world on the Lions tour to Australia? 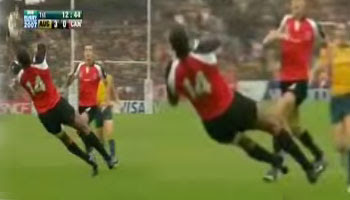 Or his scintillating slide over the white wash in the Rugby World Cup final. On friday night he was a standout for the English, one of the few players who looked to make a difference in a game where they were totally outplayed by the Springboks. With blood pouring down his cheek and constantly getting peppered with high balls, Robinson showed true guts and stood proud, possibly being the only Englishman who could threaten the Boks' organised defence. So when he pulled up with what looks like a torn hamstring, it was a sad moment for all. My initial reaction was that of sympathy, considering that it in all likelyhood will be the last time we see him on the international stage. Thiry three year old Robinson however, thinks otherwise. He is determined to return and has not given up. The results of a MRI scan on monday will confirm his fate. And if it's meant to be that it was his final appearance, then what better way than to leave with field with a standing ovation at the Stade de France. "To hear the biggest roar of the evening as I limped off and seeing everyone on their feet applauding was a humbling moment," he said. "If that's the way I am to go out of rugby, I will remember that as a very proud moment." With the Pool C encounter between David and Goliath about to kick off, I'm trying to make a prediction. Will the All Blacks score 80 points against Portugal, 100, or perhaps even 120? This is the unfortunate reality when a team making it's debut at the World Cup comes up against a side that has a rich rugby heritage and is commonly known to be the best side in the world, and probably favourites to win the tournament. Does it matter what the score is today? No. What matters, is that a minnow of the world game is getting a chance to take the field against living legends, and on the world stage in front of a global audience of millions. Portugal will today go into the toughest battle of their lives, but believe me, they'll be loving every minute of it. 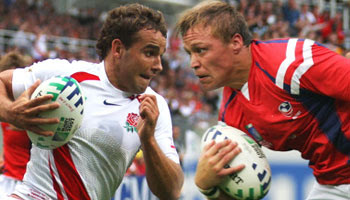 They are a developing rugby nation that, along with a few other sides in the tournament, are made up of amateur players. Every country needs to be given a chance, and unless they're given that chance, there will forever be only four or five sides in the world that stand a chance of winning the trophy. And what would be better than having sides like Portugal, USA, Fiji, and Georgia (to name a few), being able to compete with the best. It would challenge a few supporters egos, and some people will disagree with me, but it certainly is for the good of the game. Spread the game as far and wide as possible, and make rugby the number one sport in the world. And as you can see by the passion shown in Portugal's first ever World Cup singing of their national anthem, it means the world to them, which at the end of the day is one of the most important parts of what rugby is all about - pride for your country. 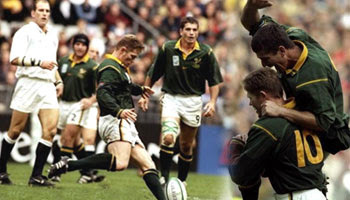 On the eve of possibly the biggest game of the 2007 WC tournament so far, we look back to the 1999 World Cup Quarter Final between the Springboks and England in Paris. It was a tense, untidy match dominated by the boot in the. England and South Africa battled it out for forty minutes, staying relatively even on the scoreboard. In the second half however, the Springbok flyhalf Jannie De Beer stamped his name into the annals of Rugby World Cup history with not just one dropgoal. But 5 of them, taking the Boks to victory and the Semi-Finals by winning 44-21. I'll never forget watching the game live in a small pub in Edinburgh, surrounded by Englishmen, but cheering everytime I saw the image of referee Jim Fleming running towards the poles with his arm up. So with the two sides meeting again tomorrow night in a titanic clash that will secure the winners a place in the next round, the question is 'Who is going to step up to the plate?'. The pool stages of the Rugby World Cup aren't about figuring out who the serious contenders for the Cup are. We pretty much know that already. Of course, there will be upsets, but really it's about giving the so called "minnows" a chance to have their moment in the limelight. In some cases these teams will use this chance to shine and seize the opportunity with both hands. This is what we saw when Ireland played Namibia in what should have been a thrashing by the experienced Irish outfit against a small African country that is primarily made up of amateurs and club players. However, team-work was truly the source of this underdog story. Yes, Ireland were victorious on the night, but the real victory was Namibia's passion, teamwork and dogged competitiveness. They slowed Ireland's ball, they defended courageously and they attacked opportunistically. The final score was 32-17 in Ireland's favour, but really, it was a night the Namibians will never forget. A night when college players took on seasoned professionals in the game we all love. This was the true spirit of rugby. Playing for the man next to you and never giving up is the way rugby was always meant to be played. Had Ireland's final try been referred to the TMO, it would have quite possibly been disallowed. Plus, I can't help but think if the ball had bounced differently in one or two instances the scoreline could've been even closer. Here's to Namibia and all developing rugby nations. If the World Cup has shown us one thing so far, it's that these smaller nations undoubtedly deserve their place on stage, as supporting roles in the greatest show on earth. England's captain has been suspended for 2 matches, both crunch encounters (vs South Africa and vs. Samoa) for this trip on Paul Emerick of the USA. The American centre gets a floating pass from Mike Hercus, who had intercepted a forced English pass. Vickery then throws a leg out in desperation resulting in what was basically a kick to the shin. Bath prop Matt Stevens will take Vickery's place in the starting line up, with Perry Freshwater being promoted to the bench. 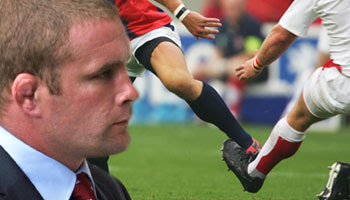 Mike Catt will more than likely lead the side in Vickery's absence. Two matches also a bit harsh perhaps. One match would suffice. But once again, the IRB are trying to make a point. 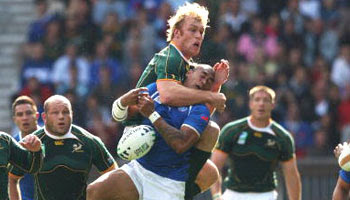 South Africa have suffered a huge blow after losing star flanker Schalk Burger for the next four matches. Burger last night received a four-match ban after being cited for a dangerous tackle on Samoan scrum-half Junior Polu during the Springboks' 59-7 Pool A victory in Paris on Sunday. It means Burger, who has 48 hours to appeal the decision, will miss his country's remaining pool games against England, Tonga and the United States. Schalk is a robust player who gives 120% every match. This means the tournament will be without the former IRB Player of the Year, until the semi final stages anyway. Four matches is harsh in my opinion, especially considering neither the touch judge or ref viewed this as a yellow card offence. 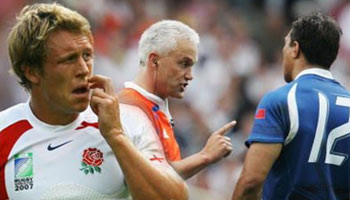 The IRB are clearly laying down the law on dirty play though, which at the end of the day is a good thing. Update: Burger and the Springboks appealed this decision, and this morning it was ruled that he will only be suspended for TWO matches, not four. So he will miss the crunch match against England tomorrow, but will be available should South Africa make the quarter finals. It was physical upfront, but in the end the muscle of a veteran Springbok forward pack was too big a hurdle for their opponents, Manu Samoa, to climb. Once the forwards provided clean ball for the backs, and after up and coming Frans Steyn came on, things opened up in mid-field for the backs. 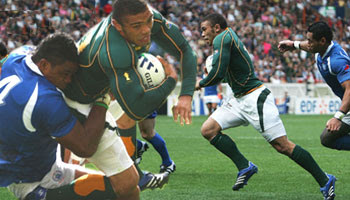 Centre Jaque Fourie crossed once, Percy Montgomery scored twice, while Bryan Habana touched down four times. The speedster Habana once again showed that he's once of the best finishers in the game. Not a bad start to the World Cup for him. 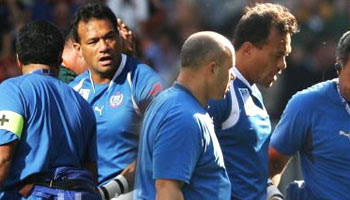 The All Blacks were in commanding form against the Italians in both teams' opening game of the tournament last saturday. As good as the All Blacks are known to be, I don't think anyone expected such an impressive display against a side that can be competitive in the Six Nations. One of the possible reasons for the 76 - 14 massacre was that when it came time for the traditional Haka, the Italians snubbed the New Zealanders by huddling instead of facing it and showing respect. This fired up the All Blacks even more. Luke McAllister and Chris Jack have both said that they felt that it was disrespectful to not face it, although every team has their own way of doing things. Jack said they do it more for themselves then the opposition, but felt the traditional Maoris wouldn't have liked the way it was treated. 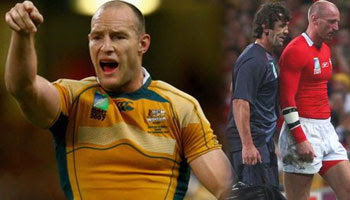 The ex-pat New Zealanders in the Italian side, Kaine Robertson and Paul Griffen, both admitted it was a mistake to not show respect the Haka . Although Italian captain Marco Bortolami was not so sure. "I think we showed the All Blacks too much respect," he said. Below is a compilation of tries from that game. Music is Yngiwe Malmsteen's 'I Am a Viking'. As much respect as we have for Brian Lima for being the only man to ever appear at five World Cups, he lost the plot on sunday. The man who demolished Derick Hougaard four years ago came on to make history against the Springboks. After being on the field for 3 mins, there was a bit of poetic justice as he attempted an outrageous tackle on flyhalf Andre Pretorious that was not only late, but very high. The big Samoan veteran knocked himself out instantly. Pretorious miraculously got up, with his head still connected to the rest of his body and probably breathing a sigh of relief after seeing the Chiropractor coming off second best. In my opinion Lima got what he deserved. This tackle was totally illegal and on another day could have caused serious injury to the opposition. If it were a little lower and earlier it would have been perfectly legal and added to his legendary status. But it wasn't. The question now is if he'll get the opportunity to redeem himself through the rest of the tournament. 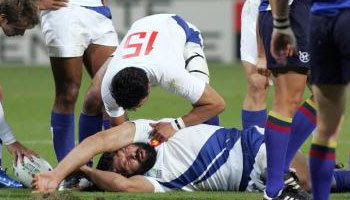 A concussion is not to be treated lightly, and with the group games still to be played, it would be tragic for the Samoans to be without him. 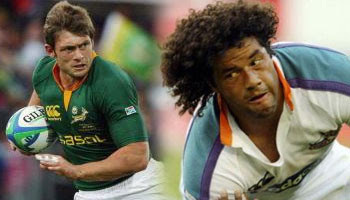 Perhaps it will be safer for the other teams though, as Derick Hougaard will testify too. Olly Barkley stood out for England in what was an otherwise dismal performance. The United States are hardly a rugby super-power but managed to at least look competitive against the World Champions, England. Here, in the final seconds of match, we see an unfortunate incident. Olly Barkley is upended by American centre Paul Emerick. Surely there was little malice, but it was still very dangerous. Luckily Barkley got up and seemed fine afterwards. Update: Emerick received a 5 match suspension for this tackle, therefore ending his World Cup. As the tournament wears on, the games will get bigger. Which means the hits will get bigger. Keep coming back as we add to the biggest archive of great rugby clips on the internet, Rugbydump.com. 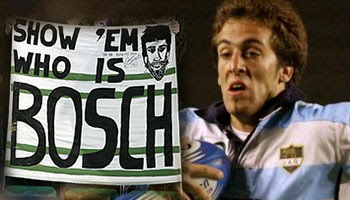 Argentina upset hosts France in the opening game of the 2007 Rugby World Cup last night. It was a scrappy encounter in which France looked totally unprepared amazingly, showing a lack of ability to change gameplan when needed. Argentina showed great guts and commitment though, tackling for their lives and desperate to once again make the point that they should be taken seriously in world rugby. Fullback Ignacio Corletto finished off this try after a loose pass from the french. Showing great pace and a brilliant running line, Corletto effectively put the game beyond reach of the favourites. After holding off the hapless French in the last 10 minutes, when the final whistle blew the underdogs showed true elation, but didn't get too carried away, with captain and fearless leader Augustin Pichot calming them down and reinforcing the fact that theres a whole lot more work to be done in this tournament. In this addition of the highly anticipated Try Savers & Rib Breakers compilation series we wet the taste buds for this years World Cup. For four years we've watched. For four years we have waited. For four years we have seen teams fight over the right to call themselves the best in the world. Now, we will see them fight for the greatest prize of all. Now, we will see them fight for immortality. The Rugby World Cup has arrived. It's no holds barred from here on in. Do or die. No second chances. Never back down. This is rugby. Serge Blanco was one of the best attacking fullbacks the worlds seen. 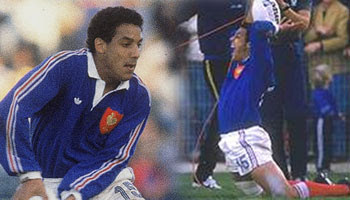 He was famed for his flair on the field and epitimised the French attitude to rugby. He also famously smoked 60 cigarettes a day throughout his career. Against the Wallabies in the semi final of the inaugral World Cup in 1987 he effectively knocked the Aussies out of the tournament with this late try in injury time. 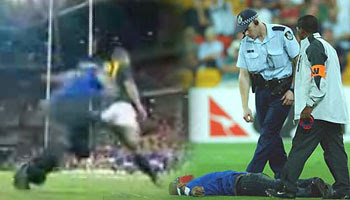 The try that broke Australian hearts is to this day considered one of the most famous tries in French rugby history, as well as World Cup rugby history. With the French kicking off this years World Cup against Argentina on friday, the world will be watching for the next superstar waiting in the wings to take the stage. Follow all the best incidents right here on rugbydump.com. 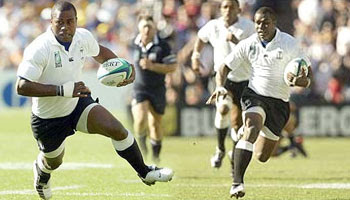 Gcobani Bobo was at one stage the Springboks new shining light at center. After a fantastic Super 12 in 2004, he looked destined for big things. But not long after his call up to the senior side, disaster stuck with a number of injuries, including an injury common to rugby players, the ACL (Anterior Cruciate Ligament) in his knee tore. Bobo was out for a long time. He returned to rugby with a contract with the Sharks from Durban, but more prominently, he played for the Springbok Sevens side, achieving success with them all around the world. He's now back playing for the Sharks in the Currie Cup, and coming off the bench on saturday against the Lions he put in two massive hits. This one, the second, jolted the ball loose for dynamic number eight Ryan Kankowski to kick ahead and show great pace to score. As well as clips from around the world past and present, we'll be bringing you the best of the best from the World Cup as it happens in the upcoming weeks, so keep checking back for the best rugby videos on the net. 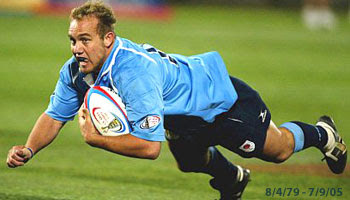 In the 2003 World Cup match between South Africa & Samoa, replacement half-back Neil de Kock scores the Boks' eighth try in the corner to end the match, but not quite. 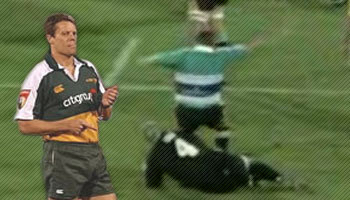 As Louis Koen attempts to take the conversion, this drunk madman runs onto the field and tries to tackle him. Koen doesn't break stride though, and still manages to convert the kick, despite Sydney resident Tapumanaia Lautasi knocking himself out on what looks like could only be his hip. Lautasi apologised to the court and claimed he didn't remember the incident, blaming it on the 8 beers he had consumed during the match. He was fined $1,200 for his actions. Just sit back and enjoy these 60 seconds of stupidity.